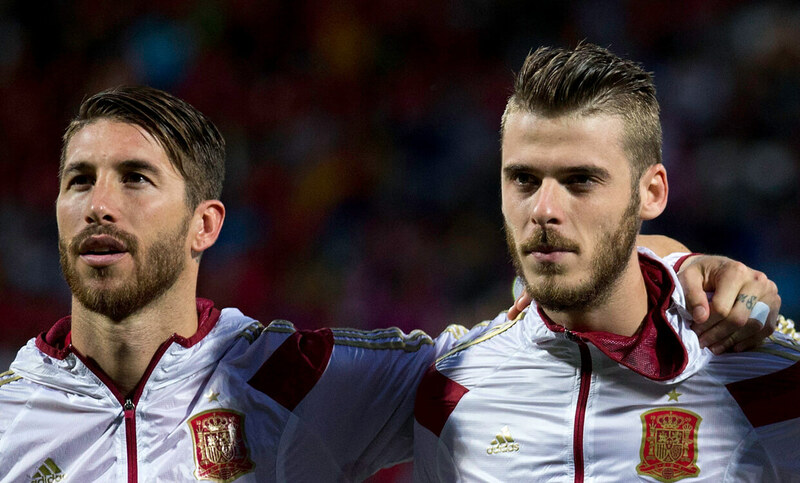 Spain were drawn into Group G of the European qualifiers, along with four-time World Cup winners Italy. The two were always likely to fight out a pool also containing Albania, Israel, Macedonia and Liechtenstein, and so it proved. After drawing 1-1 in Turin, Spain ran out convincing 3-0 winners in the decisive return fixture at the Bernabeu 12 months later. It was the Italians’ first qualifying defeat since 2006. Along with a devastating attack, Spain also had the joint most effective defence in European qualifying – the three goals they conceded in 10 games had them level with England. Alternating between a 4-3-3 and 4-2-3-1 structure, they averaged 66 per cent possession, mainly building with the quick, short passes they have become known for. They attempted a remarkable 7,495 passes through qualifying, with an equally impressive success rate of 92 per cent. They head for Russia in good form, having thrashed Argentina 6-1 in a friendly in March – but the cat was well and truly thrown into the pigeons with the news that head coach Julen Lopetegui would take charge of Real Madrid after the World Cup. His subsequent sacking, rumoured to be against the wishes of the players, has thrown the team’s preparations into chaos just days before they open their tournament against local rivals Portugal. 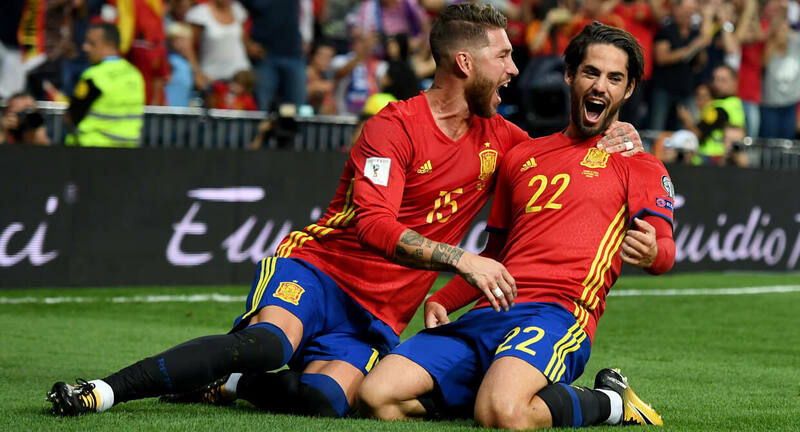 No longer reigning European nor world champions, Spain began their qualifying campaign with an emphatic opening victory in new head coach Julen Lopetegui’s first competitive match in charge. It took Diego Costa less than 10 minutes to open the scoring, as he glanced his header into the far corner. This was Costa’s first goal for Spain since October 2014, and surprisingly only his second ever for his adopted national side. Liechtenstein held strong at 1-0 down until half-time, but the floodgates opened in the second half. Costa added his second, while Alvaro Morata and David Silva (above) both grabbed braces of their own as Spain romped to an eight-goal victory. Lopetegui’s reign had got off to a strong start. After a 1-1 draw in Turin, both Italy and Spain remained locked on points at the summit of Group G. The visitors hadn’t lost a qualifying match for 11 years, but they fell behind to a brilliant Isco free-kick after 14 minutes. The Real Madrid midfielder (below) added another in the first half, striking a devastating low shot past a despairing Gianluigi Buffon in the Italian goal. Torino forward Andrea Belotti wasted chances to get Italy back in the game in the second half, but Sergio Ramos charged forward on the counter-attack and squared for Morata to tap home the match-ending third and as good as secure top spot for the 2010 champions. Fresh from another wonderful individual season at club level with Manchester United, David de Gea is a fine first choice for the Spanish national side. Having won both player of the year and players’ player of the year at Old Trafford, he approaches the World Cup in arguably in the finest form of his career. Born in Madrid, de Gea is a youth product of Atletico Madrid who made his first-team debut as a substitute at just 18. On his full La Liga debut, he gave away a penalty and then promptly saved it. Having moved to join Manchester United in the Premier League at 20, he faced early criticism for a perceived lack of courage and aggression, particularly when dealing with aerial crosses. His strength of character in the physical cauldron of English football, combined with a patient coaching staff who knew what they had, soon paid off however. De Gea (below, right) brings a calmness with the ball at his feet – a quality not often associated with goalkeepers in the Premier League – and while United have struggled to challenge for titles in recent years, he has proved his worth with countless world-class individual performances. A fine shot-stopper on both sides with both hands and feet, de Gea is an accurate thrower able to set up quick counter-attacks if the game requires them. Spain boast very possibly the world’s best goalkeeper. World Cup winner Ramos (above, left) has had an illustrious club and international career. The tenacious central defender has led both Real Madrid and Spain to multiple trophies with fine individual defensive performances. After emerging through the academy at hometown club Sevilla, Ramos was bought by Madrid after only one season of first-team football. Since his move in 2005, he has established himself as one of the world’s great defenders and the heartbeat of the team. 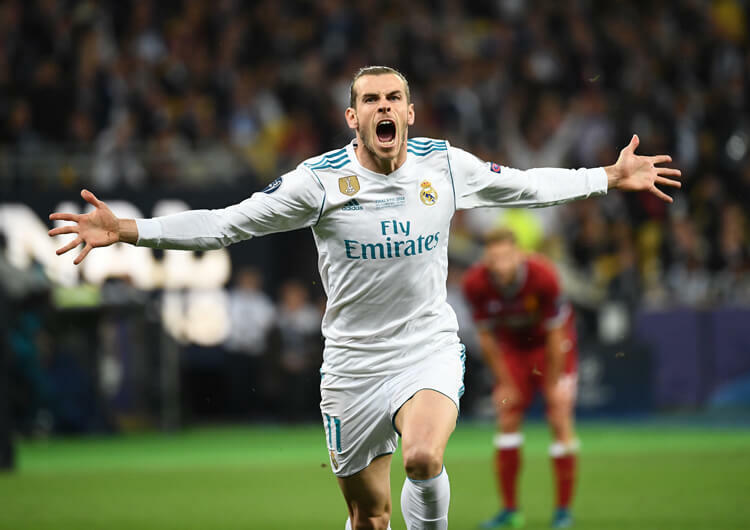 With Real, the 32-year-old has won four La Liga titles and as many UEFA Champions Leagues – the most recent of which came with a victory against Liverpool, in which he played a central part, in this season’s final. With Spain, he won back-to-back European Championships in 2008 and 2012, either side of his country’s maiden World Cup victory at South Africa 2010. Breaking through as an attacking right-back, Ramos has developed into an imposing and explosive central defender who leads from the back with passion and desire. A longstanding master of the dark arts of the game, he is also a fine passer of the ball who helps both club and country with a clean build from the goalkeeper. The Real captain is also a solid asset at defensive set-pieces and a constant threat at the other end. His career is littered with a string of important headed goals – he has scored in six major finals for Madrid, four of them headers. Diminutive midfielder Isco is just one fine example of a midfield overflowing with talent. A proactive dribbler, he is a superb attacking asset for both Real Madrid and Spain. Isco’s successful spell at Malaga, after a move from the Valencia youth system, laid the foundations for his subsequent rise. He was an integral part of the team that reached the 2012/13 Champions League quarter finals under Manuel Pellegrini before joining Carlo Ancelotti at Real. The midfielder initially struggled to fit into Madrid’s 4-3-3 system, however, and couldn’t cement a regular starting place despite a consistent combined record of both goals and assists. In the seasons since, and particularly under Zinedine Zidane, Isco has found himself a regular starter for club – and, now, for country. Often starting as a wide midfielder, he likes to drift inside, often moving into different spaces each time he receives the ball. Rarely motionless, his fluidity often creates spaces for his teammates to exploit. He also possesses a wonderful final ball, capable of unlocking the most stubborn of defences within the final third. He is without question a potential star of Russia 2018. After the dramatic dismissal of Julen Lopetegui in the wake of his announcement as Real Madrid’s next manager, Fernando Hierro took over the head coach’s role only two days before Spain’s World Cup would begin. The former central defender – who won 89 caps for his country over a 13-year international career – was the swift choice to move across from his previous role of sporting director. The 50-year-old began his playing career with Real Valladolid, but moved to giants Real Madrid at the age of 21 and over a 14-year spell with Los Blancos established himself as an all-time club legend. He matured from a no-nonsense central defender into a ball playing sweeper and even at times a defensive midfielder – and he certainly knew where the goal was, netting more than 100 times for the club. In his time at the Bernabeu, Hierro won five La Liga titles and three Champions Leagues. Brief periods with Al Rayyan in Qatar and Bolton Wanderers in the Premier League came before his retirement as a player, after which he moved into the national team set-up as sporting director while taking his coaching badges. He subsequently joined Malaga as director of football, before rejoining his beloved Real as part of Carlo Ancelotti’s backroom staff – replacing Zinedine Zidane, who had agreed to take over Real Madrid Castilla. Hierro’s sole role as an outright number one before this World Cup came at Real Oviedo in the Spanish second Division. After missing out on the playoffs on the final day of the season, he left for a second spell as sporting director of the national team. 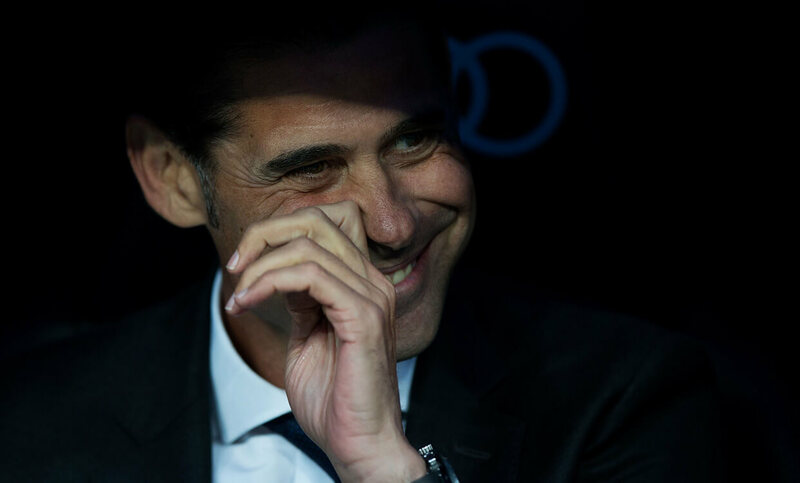 Despite his inexperience as a head coach, Hierro will have seen the development of many of the players he now oversees at close hand – particularly those who play for Real, of course. He knows Spanish football inside out, and will have the respect of his squad – this will be important as they try to navigate the inevitably choppy waters presented by the storm of Lopetegui’s departure. In qualification for the past three major tournaments, including this one, Spain have conceded only three goals apiece. 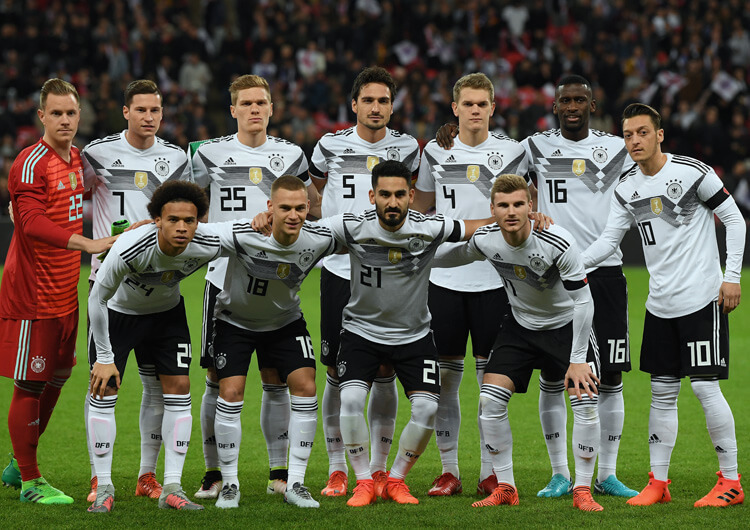 Their recent tournament form has been less impressive, however; across the 2014 World Cup and the 2016 Euros, they conceded a combined 11 goals in just seven matches. One key defensive issue in the past two tournaments has been dealing with counter-attacks in wide areas. As both full-backs – particularly Jordi Alba (above, right) at left-back – look to push forward in attack, this naturally leaves spaces for opponents to transition through. Wingers who boast express speed when running with the ball can thus cause Spain problems. Wider transitions will also put pressure on Spain’s ability to deal with crosses at the far post (see above). Throughout the past two tournaments, and in recent qualifiers, Spain’s smaller full-backs have proved no match for larger, more powerful forwards. Opponents will naturally look to take advantage in these areas, putting more pressure on Sergio Ramos, Gerard Pique and taller midfielders such as Sergio Busquets to cover for their full-backs. Throughout qualifying and recent friendlies, Spain have alternated between a 4-2-3-1 and a 4-3-3 structure. The desire to create central overloads runs deep in this Spanish squad. With their vast array of talent within central midfield, it is easy to see why. When attacking in a 4-2-3-1, they have more defensive stability, as Sergio Busquets and Koke will provide central cover as a more defensive pairing (above, left). The attacking width in this formation will usually be provided by both full-backs, Dani Carvajal (if fit) and Jordi Alba. From here, Spain can look to use the aerial power of Diego Costa, with attacking crosses from either flank. This shape still allows Spain to maintain a high presence in central midfield, with players such as Andres Iniesta, David Silva, Marco Asensio and Isco roaming from wider positions into the middle, thus creating spaces for the full-backs to attack. Spain have also utilised a 4-3-3 formation, with Isco often used as a false nine (above, right). As with the previous attacking set-up, both wider midfielders will look to move inside and congest the central lane of the pitch. This method is best used when Spain are looking for central penetrations, possibly against taller and less mobile central defenders. Perhaps the easiest way of paying tribute to Spain’s strength in depth is to select a team of those not selected in the initial squad for the finals (above). In front of Villareal’s Sergio Asenjo in goal, Javi Martinez and Marc Bartra would provide an excellent central defensive blend of youth and experience. Full-backs Marcos Alonso and Sergi Roberto would provide excellent attacking width, as per their respective roles at Chelsea and Barcelona, while the Premier League central midfield trio of Cesc Fabregas, Ander Herrera and Juan Mata have the combined experience and technical ability to control any international match. Wide players Jose Callejon and Pedro were unfortunate exclusions, as Julen Lopetegui opted to select extra central midfielders rather than traditional wingers. They could support another unfortunate absentee in lone striker Alvaro Morata (above, right).